Chion-in temple is located in Higashiyama-ku, Kyoto. The temple is a temple of the Jodo (Pure Land) sect of Buddhism. Chion-in temple was originally built as a zenbo (priests living quarters within a temple) by the priest Honen (Founder of the Jodo sect). 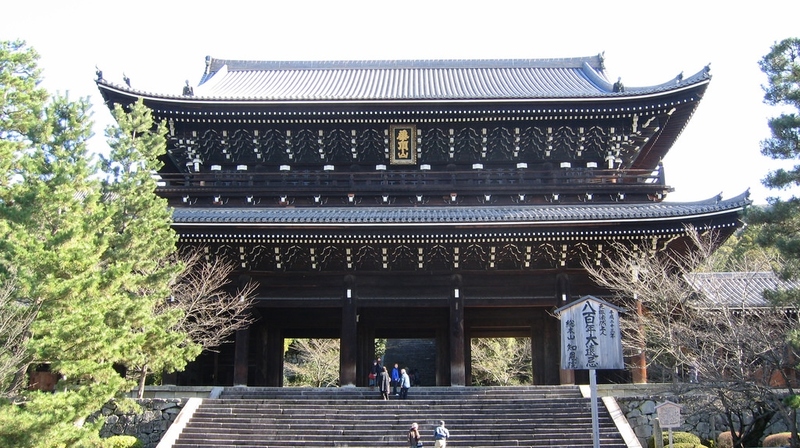 The Sanmon Gate (Main entrance gate) is located alongside the road between Maruyama Park and Shorenin Temple, designated by the Japanese government an Important cultural property. Sanmon gate is the largest wooden gate in Japan (24 meters tall and 50 meters wide) and dates back to the early 1600s.This gate Other Important cultural properties at the temple are buildings such as the Kyo-zo (storehouse for sculptures), Miei-do (hall enshrining the founder of the sect), Dai-hojo (room for the head priest), Sho-hojo, Chokushi-mon (gate for Imperial messengers), Dai-shoro (large bell tower) and Kuri (kitchen and living quarters for priests). The temple is also renowned for its Uguisu-bari (literally “bush warbler floor boards”), a corridor which, when walked upon, sounds like the singing of a bird. Access : 10-minute walk from Higashiyama station on the Kyoto subway Tozai-line. Bus : Bus No.10 from JR Kyoto Station to Chion-in-mae Bus Stop. The massive head temple of the Buddhist Jodo sect attracts autumn color viewers by illuminating its temple grounds and its gardens. At Chion-in Temple, 17 monks work together to ring a massive, three-meter tall, about 70 tons great temple bell at 108 times on December 31st. This traditional ceremony has existed in Japan since ancient times. Visitors come to have a look at the powerful bell ringers and be purified for the new year.